The 12 days of action for the elimination of violence against women take place every year throughout Quebec and Canada from November 25, the International day against violence against women proclaimed by the UN, until December 6, National Day of Remembrance of the Polytechnique massacre. The 12 days of action are part of the International campaign entitled 16 Days of Activism against Violence against Women. Despite significant progress, much work remains to be done for equal rights stipulated in law to lead to equality. Women still account for nearly 85% of victims of conjugal violence and more than 95% of victims of sexual exploitation. Only 22% of conjugal violence victims and 5% of sexual assault victims officially file a complaint. According to WHO, one in three women will experience violence during her life, and this rate is three times higher for Aboriginal women. In the context of this event, we organize a fundraiser. 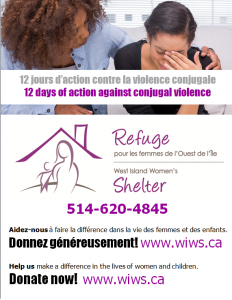 All collected funds will go to women and children victims of conjugal violence of the West Island community.